The SUNY College of Environmental Science and Forestry (ESF) has, for the seventh year in a row, earned a place among the top universities in America, as ranked by U.S. News & World Report. ESF is ranked at 38 in the list of the top 50 public national universities, and at 85 in the list of best national universities, which includes both public and private institutions. In the “Great Schools, Great Prices” category for national universities, ESF is ranked 33. Last year the College was ranked 43 in this category. 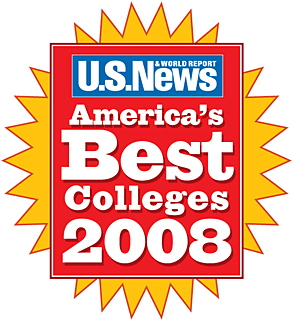 ESF is the only SUNY institution listed in this category. The formula used in this category balances a school’s academic quality with the cost of attendance. ESF also was ranked highly in the category of colleges and universities with the highest proportion of classes with fewer than 20 students. The college was tied for third place, at 76 percent. “This ranking serves to reaffirm the work of our faculty, staff and students in creating a great learning environment,” ESF President Cornelius B. Murphy, Jr., said. Three U.S. News reporters set out on regional college "road trips" to get slice-of-life views of what it's like for typical prospective students and their families as they search for colleges with strong science-based degree programs. SUNY-ESF was one of four northeastern schools the magazine selected to explore in greater detail. You can read the writers' impressions in the August 27, 2007 edition of U.S. News & World Report. The project also yielded a series of videos. View Science in the Northeast for a quick look at ESF at the other featured colleges: MIT, RPI and Clarkson. Visit our Admissions and Catalog websites for information on programs, campus visits and application.